take advantage of it to write down the monumental stupidities you’ve committed, see if you can come to grips with them. In the audiobook version I enjoyed, as the narrator began speaking in the voice of the 19-year-old female main character in Maya’s Notebook, she sounded far too mature, using unrealistic vocabulary and sounding too worldly. Soon, however, that didn’t matter because I was spellbound by Maya Vidal’s troubled past. She’d experienced complex problems and was running from drug lords, international criminals, and the FBI, and she comes from a highly unusual family; clearly her life was more complicated than an average teen girl’s. She was sent by her Chilean grandmother, her Nini, to Chiloé Island, perfect as a place for banishment or exile, to ride out the danger with an old friend of Nini’s, Manuel Arias. Manuel is a man with a mysterious and painful past as well. The narrative floats easily between Maya’s present in Chiloé and her past in Berkeley, California, then a rehab academy in Oregon, then in Las Vegas where she reaches the darkest pit of her degradation and suffering. Just when you think her story has been told already, it just gets deeper and more layered. Maya’s Notebook is an Adult Fiction title which would likely appeal to many older teens, but the book contains very graphic scenes of criminality, violence (both sexual and drug-related), sexuality, and extreme drug use. It’s available in the WRL collection via regular print, audiobook on CD, e-audiobook, and in large print. 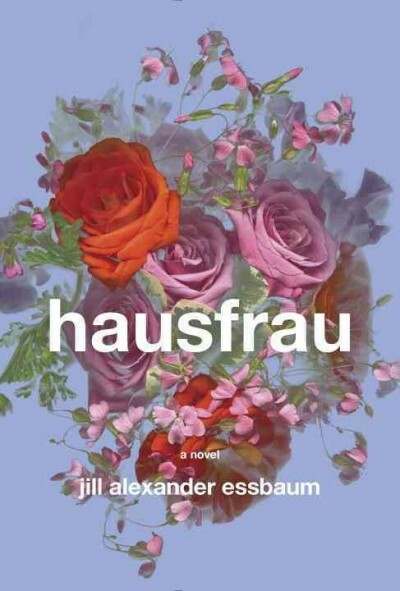 Poet Jill Alexander Essbaum transits into the fiction genre with the precision of Swiss clocks and indeed Swiss trains — ushering in a new Madame Bovary, an Anna Karenina for the 21st century. Her name is Anna Benz, and she lives in Zürich with the Swiss banker she met in America. Anna doesn’t know how to drive her family’s car. She barely knows a soul beyond her mother-in-law, three children, and a few acquaintances; she maintains no contact with American relatives. Anna barely speaks German, endures life with no fire of spirit, and performs her duties as spouse and parent through unvaried routine, weekly circuiting her usual shopping points. Following initial bewilderment nine years ago, she has mastery over the intricacies of Zürich’s rail network. The author shows us Anna’s clumsiness occasionally, making her so real. She dresses impeccably, even fashionably— her clothes seem to me like an attempt at self-preservation–yet usually has no place to go, no plans, no one to see. The utter sameness just drags on….I am beholden to my own peculiar irony: to survive I self-destruct…. Anna’s insightful internal voice show her to be intelligent, discerning, never oblivious yet she finds no will to extricate herself. Then, Anna remarkably makes a genuine female friend. Mary represents for Anna an unexpected opportunity to confide in someone trustworthy, to explore possibilities, but does she avail of it? The accurate phrasing of painful emotions will have many readers relating easily to Anna’s psyche despite the fact that they’ll wish to shake Anna into shaping up and reviving herself from the mess she’s made. I absolutely loved its style of presentation, and its use of Swiss words intrigued me and enhanced the setting. Once you read the end, you realize how exquisitely tuned the poet author has made it and immediately return to the first page and begin it again, with Anna. I look forward to more good things to come from Jill Alexander Essbaum. Yes to the Mess introduced an entirely new model among leadership and business titles, and Frank J. Barrett, a jazz musician himself, brilliantly succeeds at utilizing real-life examples to illustrate that the risk-taking and improvisational mentality practiced by jazz musicians is akin to what successful business leaders do. One example is the accidental invention story of Play-Doh (and its patent), resulting from letting Cincinnati school kids fool around with a sticky wallpaper cleaner and finding it the perfect modeling clay for youngsters. Practicing the art of jazz improvisation through risk-taking in today’s unclear, complex, evolving universe can reap innovative benefits that more linear thinking and traditional top-down leadership can hinder. The media and public opinion are unfairly harsh on those who take the risks that produce innovation. It often takes a lot of failure to produce brilliance. Barrett shows that leaders can instill trust in others by revealing vulnerabilities and the human capacity to make mistakes just like the rest of us, being open to correction and feedback that can improve things throughout the team’s efforts. Jazz “fallibility models” inherently accept this sort of model that allows the leader to sometimes be taught by underlings—as Ellis Marsalis reportedly learned a few new things from his son Wynton. Barrett emphasizes the need to be storytelling and brainstorming and roleplaying in order to discover the unexpected and the unplanned solutions, and for just doing: hands-on learning experiences, not just knowing what’s in the rule books. Some skills simply are “not easily articulated, codified, or stored.” Serendipity (one of my favorite things!) means that solutions are not always straight from some manual. Jazz improvisers and great scientists and innovators alike know the value of keeping at it: making guesses, trying things out (sometimes repeatedly), tinkering with incremental adjustments, all with an open spirit of curiosity and wonderment. This jazzy attitude reminds me of experiences I’ve had with the iterative process of beta-testing databases built from scratch when I was in library school. It taught me to appreciate the inevitable shortcomings of most end products we encounter as consumers—there really is no such thing as perfection. More than a few databases could have used a bit more tweaking before release, such as the “very public beta test” of Healthcare.gov. On the other hand, can you imagine not having Amazon’s database, or IMDB? How about not being able to search the library’s online catalog database and returning to the old days of the handwritten card catalog? Today’s librarians could only step up to that plate after crash courses in penmanship! Barrett annotates a set of “eleven practices and structures that can help your organization emulate what happens when jazz bands improvise.” My two favorite take-aways are that we should all get a chance to solo now and then and that play flows into learning. This book should have widespread appeal far beyond the jazz music fans most likely to notice it first. Check the WRL catalog for Yes to the Mess. Just moments after I literally turned to my husband and whined, “This book is beginning to feel like a Lifetime movie,” the next page I read included these thoughts from the character Sarah St. John: “Makes me think of those movies on Lifetime… ” Even the author knows what she’s done! Still, I could not put the book down and truly wanted to know how everything would turn out, just like when I’ve found myself settling onto the couch to sit through one of those afternoon family films, intensified around some very focused topic like a teenaged girl with an abusive boyfriend. I very much enjoy Kaui Hart Hemmings’ style—The Descendants is one of the most entertaining novels that I had read in ages, with unforgettable characters and highly amusing dialogue, and I just prayed that it was not a one-hit wonder. I feel that Hemmings still has a lot of great storytelling in her! The theme, characters, their dialogue, and the setup for The Possibilities all had potential for achieving the same greatness, but, unfortunately, fell a little short of my expectations for this new novel. I do not regret reading it, however, because sometimes I can truly relate to the Lifetime movie-type themes. In fact, anyone who has grieved when a loved one dies young knows the life-changing nature of such an event. We are invited into the mind of a grieving mother whose only child, Cully, dies in a tragic accident in Breckenridge, Colorado at the age of 22. We get inside Sarah’s head, all of the uncomfortable thoughts and judgments of others that bubble up in the wake of tragedy, how her life can never really be the same again, ever. She’ll probably even have to entirely change her career, since the tourist-industry television program she co-hosts in her resort hometown now feels so incredibly shallow. Grief removes one’s facade, the games we allow ourselves to play in order to get by, and suddenly every single aspect of our lives begins to filter through a new lens attached to us by the loss. Others certainly mean well, but they just can’t imagine how their words and behavior affect the one reeling in emotional stress. Sometimes, it’s the unspoken feeling that your grief trumps the heartbreak of a friend’s divorce or a young person’s seemingly trivial frustrations, and the occasional mistake made in actually mouthing your unacceptable thoughts out loud. You eventually feel guilty for withholding your friendliness, denying others their needs, and perhaps holding on to your grief far too long. Something at the root of this story really strikes a chord about today’s society, single mothers, and the choices regarding pregnancy out of wedlock, as Sarah contemplates her past and deals with a new crisis brought on by the appearance of Kit, a young woman who knew Cully in the months before his tragic death. The main characters go on a journey together, a theme Kaui Hart Hemmings seems to like as a vehicle for bringing everything in a story to its ultimate truth and crux. The Possibilities was a book I had highly anticipated, and I will definitely be on the lookout for Hemmings’ next book. Check the WRL catalog for The Possibilities. This very satisfying debut fiction from a seasoned food writer was delightful to listen to on audiobook CD. Julia Whelan got most of the parts spot on, and even though deepening her voice for the male characters is a bit comical, the lively reading of Ruth Reichl’s intriguing tale and multifarious characters kept my daughter and me engaged thoroughly. She and I enjoy sharing many of the same books, especially adult titles that also hold appeal for teens. In fact, I would not be surprised to see Delicious! turning up among YALSA’s 2015 Alex Award nominees for books published in 2014—I hope, I hope! Billie Breslin, also known as Wilhelmina to the Fontanari family, where Sal calls her Willie, feels fortunate to have landed a competitive position at Delicious magazine (obviously inspired by Gourmet, which discontinued in 2009 and was last headed by Ruth Reichl as editor). It doesn’t take long for Billie’s extraordinary palate to be recognized; she has the uncanny talent for detecting even the most obscure ingredients and flavors and has a knack for suggesting the precise tweak needed to perfect a recipe. Yet, she adamantly claims that she is definitely no cook! Her new friends in New York soon suspect she’s harboring some darkly saddening secret, however. Meanwhile, she’s determined to work her way into food writing, which she quickly and very cleverly accomplishes. Delicious magazine closes down, but Billie is retained to handle customer service matters, working solo in the Timbers mansion, where she stumbles upon a secret room. Mysteriously secreted letters slowly reveal the details of a World War II correspondence between a 12-year-old girl interested in cooking and Chef James Beard when he was on staff at the magazine. We’re also provided with letters written in the present, diary-like words Billie addresses to her older sister. This partially epistolary read brings the reader deeper into the thoughts of our leading lady. The plot revolves around Billie’s collaboration with Sammy and Mitch to preserve the historic letters and library before it’s too late. Some of the most remarkable characters in Reichl’s very clever and page-turning tale are those who are not actually in this story but mentioned in the letters and by the characters, the librarians who organized the forbidden library and the legendary James Beard. Along the way, readers will learn fascinating details about war-time prejudices and the history of culinary challenges during rationing. Readers will even be taken on an architectural history tour of New York and learn historical tidbits about the Underground Railroad. Delicious! is delightful, and it is so pleasing to see one of America’s food-writing favorites succeed as a novelist too. Check the WRL catalog for Delicious! Or check out the audiobook, read by Julia Whelan. Frances Mayes nurtures a sense of home wherever she travels and writes, frequently envisioning herself buying the rented house and settling in even while just visiting. Literal homes seem to blend and expand with a myriad of temporary residences as she reflects upon flavors, tastes, scents, scenes, poetry, cultures, and histories. She and husband Ed explore a rich variety of exotic as well as ordinary destinations, sweeping a wide radius from their Tuscan epicenter through a European, Mediterranean, Asian, and African playground. Everything I pick up seems to lure me away. … A desire to go runs through me equally with an intense desire to stay at home. The memoir hints that this year’s travel in the world is a means for Frances and husband Ed to escape the dust and chaos of the ongoing contracted work at their perpetually-being-restored ancient Tuscan home named Bramasole. Or maybe it’s the growing sense of danger, with the possibility of random violence invading their domicile in northern California that pushes them away from home. I didn’t know how deeply refreshing the landscape could be. The place does seem familiar, perhaps at a genetic level, but in a a nourishing way. Or maybe I’m just familiar with these friends, and when one is at home with friends, the surrounding world becomes friendly, too. Whether traveling with newly made friends or rendezvousing with dear old friends, Mayes reflects on their friendships and fond memories, predicting potential relationships with new acquaintances or expressing relief that she won’t have to sit next to such boors as some of the cruise ship passengers at each meal. I found her most humorous when describing the absurdities of cruise ships and their tendency to transform passengers into cattle, driven through crowded tourist traps. Mayes’ first choice for travel is definitely not the cruise, preferring to rent homes and literally plant roots for a while in one village. My early impressions of A Year in the World were tainted by my annoyance with what seemed constant obsession with food, especially meat and meat by-products, all forms of dairy and excessive indulgence in pastries on the part of Ed. I could assume he is quite rotund, despite his apparent energy and enthusiasm for daily excursions, even long strenuous walks in extreme heat such as their daily hikes to see the architectural and earthly wonders along Turkey’s Lycian coast. Could they possibly eat such meals while at home and shouldn’t they be more cautious with regard to health? My perspective did begin to soften once I reached the chapter on the British Isles—as they romped through English garden after English garden, I became so interested in garden tours. I love, and now wish to adopt, their habit of taking notes for use in the improvement of their home veggie, fruit, and flower growing techniques and varieties of plants. She describes serendipitous moments, such as finally coming across roses similar to a mystery species thriving in their Tuscany garden that was inherited after 30 years of neglect. The book comprises about a dozen or so travel essays. Each may be dipped into separately or in sequence, yet it’s not the type of book you’ll read straight through. I started it months ago and picked the book up for just a chapter or two at a time, escaping to fascinating travel spots such as Andalucia, Scotland, and Mani. Mayes’ brief yet insightful reviews of books she travels with tempt me to add her inspired selections to my personal reading list. You may find it surprising that the title belies the format; you’ll seldom be aware of the month or year of her travels, and it’s never clear whether each of these trips occurred within a single year. That doesn’t matter, since you will be mesmerized by the poetic and lyrical way in which she transports you to a place and a moment, enveloping you in her experiences. Check the WRL catalog for A Year in the World. WRL also owns this title as an e-book. More than any other parenting book that I read and used while raising my now teens and young adults, this classic title made the most impact on my family’s life. Because of communication techniques learned from John Gray, my children commonly ask, “Mom, what may I do to help you?” Better yet, I often return home to find delightedly that the dishes are washed, the laundry done and put away, and the floors vacuumed or swept without even having asked the children to do it! They have learned to observe what needs to be done and to proceed to take ownership of the task. A household then becomes more efficient much in the same way a business may foster efficiency through employee ownership. Furthermore, I have found that my children love to be of service to other individuals and organizations without expectation of rewards or reciprocation, just for the joy of giving their time and effort for the benefit of others. Something very significant in child rearing can be achieved simply by respecting kids’ opinions and viewpoints in the manner you would like to be treated, accepting who and what they truly are, listening to them well, and regarding them as innately benevolent beings who want to behave well and do the right things in a positive atmosphere. Most people realize that negative parenting can harm kids and may only achieve temporary control over children who learn to anticipate the age of 18 with a vengeance so that they can finally live the life they want! On the other hand, Children are from Heaven helps parents guide children toward a better quality of life and healthy relationships through encouragement, clearly described expectations, and positive statements that never shame, order, or demand in unreasonable tones. Children just cannot bear yelling without slipping toward rebellion. They’d truly rather be in your good graces. A great example of how Gray’s book can help parents to elicit cooperation from their kids: “Ask but do not order.” This translates to avoiding a command such as “Don’t leave that there” by replacing it with a more positive request such as “Let’s now put our things away. Would you please put that away?” Instead of demanding, “Stop talking,” to gently say, “Let’s be quiet and listen to your mother. Please stop talking,” elicits a more enduring and peaceful compliance. Little by little, this style of communication becomes highly effective. Gradually, you discover that you no longer have to ask for good behavior as often; you simply witness it in action and will be praising your amazing children frequently! You find that this sort of gentle guidance works to develop children who begin to think on their own about how to live more peacefully and helpfully without waiting to do what they are told. John Gray, a very experienced family counselor, happened to become a father and shares examples from the challenges of raising his children. The lovingly effective communication techniques he applies to parenting utilize much of the same psychology found in his bestselling marriage and relationship book, Men are from Mars, Women are from Venus. In fact, using some of the advice I read in Children are from Heaven proved quite effective in improving communication with my spouse too! There are a few tricks found here that really work well when you have a “honey-do” list and want life-changing results. I am confident that this parenting book can help you to realize the great joys of parental involvement and to enjoy a higher quality relationship with your precious children. Check the WRL catalog for Children are from Heaven.